A box for the book cards..
Floral sprays and a box..
Another example of my handmade floral spray used on a card.The papers are Kaisercraft PS I love you,and the die is paper rose Ornate circle . I used a collectable doily ( from the paper collection) under the circle. This card could be used for wedding, engagement or anniversary..or even Valentines day!Quick post today as it’s awfully hot sitting here at the computer, I am going to find a nice spot under an airconditioning vent to sit and read a good book! til tomorrow…. I found another Kaisercraft velvet Crush card that I hadn’t posted! 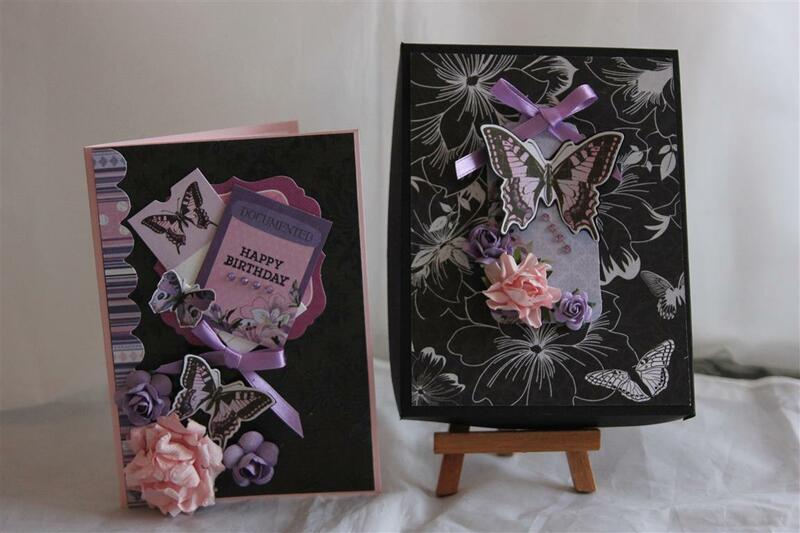 The card ( on the left) makes use of the matching collectables in the range, and some kaisercraft and prima flowers and ribbon. ( the cardstock is stampin up pink pirouette and black) and when I had finished it I realised it wouldn’t fit into an envelope as the flowers were too bulky, so I made a box and decorated it to match. I like making these card boxes, so you may be seeing some more of them… may have to do a youtube video of how to make….I had a great morning over at Paper Flourish this morning, met up with some friends, had an enjoyable card club, and bought some new papers from Prima, Tim Holtz,and heartfelt creations and can’t wait to start making with them. Til tomorrow….